Fellow Rutgers grad Jim Barry shared with me a link to a press release on the RULost iPhone app. While I was initially excited to see Rutgers come out with an app to aid students in navigating the huge New Brunswick campus (which is actually 5 campuses split between New Brunswick, Piscataway Township, Edison Township and a small portion in North Brunswick Township) and its extensive bus system, after plunking down 99¢, I’m not so impressed. First off, I’m including a snapshot of the home page, even though you’ve already seen it if you read the Rutgers press release. What is absent from the press release shot is the advertisement that is at the bottom of a paid app. Granted, unless they sell this app to every student, professor and alumni, which is highly unlikely, they’re not going to make much money off of it. I could see using advertising to further your profits on a game or social media application, but you shouldn’t be monetizing your orientation or transit system’s information. This info should be as widely disseminated as possible, as more informed students are more likely to remain safe when traveling through and between campuses. I am working with several people at Rowan to better develop mobile apps for our students. I’m pushing that the apps, especially my mapping apps, be developed as HTML5 apps. The reason is simple: this is information you want easily accessible to students and HTML5 is the most open, accessible platform for mobile development at this time. Information keeps students safe. Especially on a campus as large as the New Brunswick campus of Rutgers, students need to know where to go and how to get there. They need easy access to that information and a mobile app that has any charge applied to that is not accessible to all. Even if it were free, the app still fails to help the students get where they are going. Put yourself in place of a freshman, not knowing which town to be in, let alone which building. 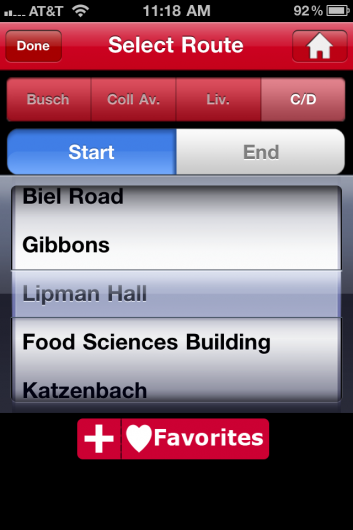 Here’s how the RULost app provides bus routing. No map to guide you. No location-based services to automatically pick the closest bus stop first. Just a list of names and a somewhat clumsy interface (home is at top right and done at top left, reversed from the norm). 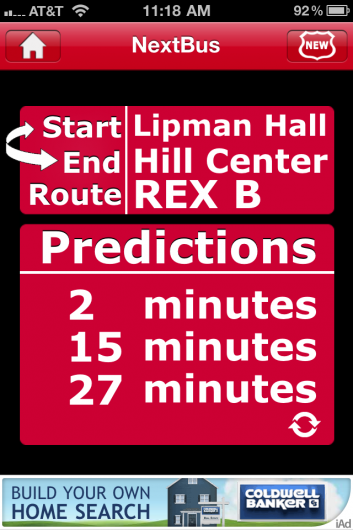 The app talks to the NextBus API, an can deliver predictions as to when the next bus will arrive. This is where the app is worth 99¢. When waiting for a bus, it is incredibly helpful to have realistic estimates of arrivals. However, this only helps students already familiar with the complex Rutgers bus system. A bus system map – even a static map – would be incredibly helpful to new students. Adding maps to mobile devices is fairly trivial. Hell, even the main rumaps.rutgers.edu site works fine in Mobile Safari, and there isn’t even a link to it from within the RULost app. 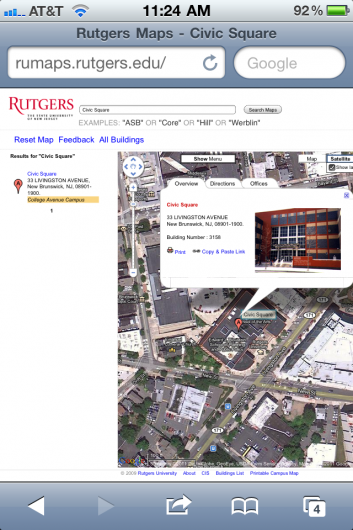 Even the instant search works, allowing you to type in a portion of a Rutgers place name and locate it on a map. The RU Maps page is not really geared to mobile devices, but it does work on Mobile Safari, albeit with quirks. And without ads. Buy this if you want to support current Rutgers students. Buy it if you want to see a good example of using the NextBus API. Otherwise, don’t buy it. It needs a lot of improvement before the entire campus is going to be using it. Having said that, I think the app has a lot of promise and other universities have released iPhone apps (like UOregon, a free app) to great success. And I don’t believe any of them have been student projects, like RULost. However, despite the few positives, this app needs more time in development before it can really be useful. This entry was posted in Data, Mass Transit, Technology, Transportation, Web Mapping and tagged HTML5, iPhone App, RULost, Rutgers. Bookmark the permalink. One Response to RULost? I hope not. My name is Kyle Sherman. I am the Project Lead and Principal Software Developer for RULost. I wanted to send you an email instead of posting a comment to the article, but I could not find an email for you. I would like to mention that RULost is in no way affiliated with Rutgers University. First, I would like to say that myself and the developers appreciate your very honest feedback. I would like to address your concerns. First off, I would like to give you an idea of how RULost came about. Myself and 4 other Rutgers Electrical & Computer Engineering seniors (class of 2011) decided to make an iPhone app for Rutgers as our senior design project. 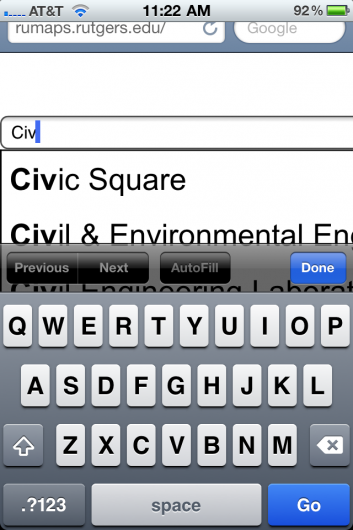 We created the entire app in the Spring 2011 semester while taking a full load of classes. Having said that, we tried to narrow down our feature set to what ourselves and our users would find most important. We had many other features planned, such as Maps, which were not able to be implemented during the semester because of the extraordinary amount of work involved. I will speak specifically to Maps later. I would also like to point out the fact that out of our 5 members, I was the only one with any Objective-C/iOS programming experience. The others learned during the course of the project and did a great job. RULost began out of the frustrations we had with working with information at Rutgers. The first thing that we found most frustrating was the bus system. The NextBus portion is meant to be useful for freshman and NextBus pros. It is the fastest way to make a selection and get your times back. What you say is true: a freshman still has to know what building, but that is something you learn essentially on day one, or by asking anyone around you (trust me, I know). I agree that it would be great to have a Maps section instead, but as I said I will address that a bit later. I’m not sure that you realize the extraordinary amount of work that went into the NextBus portion of RULost. 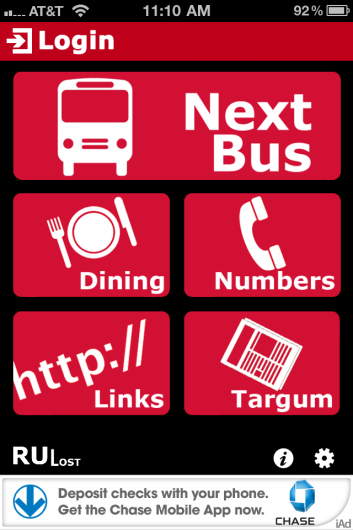 RULost’s NextBus portion communicates with our server and users our TripPlanner algorithm to decide what route you should take and even includes transfers if necessary. This was an amazing feat, considering the terrible infrastructure that is the Rutgers/NextBus system. I can go into details on this if you would like, but just know that we could not just use a simple Dijkstra’s shortest path algorithm. It is true, NextBus is lacking GPS at the moment; we were planning on adding that during the semester, but we just didn’t have the time. We are currently working on a new version, and I hope to be able to have that in there by then. This would allow you to just tap the GPS button for it to automatically select your starting point based on your GPS location. The interface is designed to be the absolute least amount of taps possible while still providing the information without having to scroll through long lists or navigate multiple views. I have to say that I have had nothing but good feedback so far on the interface. Having said that, we also have 2 more different NextBus interfaces planned for a later release which will provide different functionality. As I said, there wasn’t enough time to complete these during the semester. Now, for Maps. Maps is an extremely large task to take on as I’m sure you are well aware. You have pointed out that Rutgers has its own Maps system. We have been in numerous meetings with OIT (Office of Information Technology) ever since they reached out to us back in May about many things, but most importantly Maps. They admit that their Maps system is not well implemented at all, completely decentralized, and has completely incorrect coordinates for numerous buildings. That implementation may look sort of nice, but in reality it is really not complete. This is the reason we did not add this as a link in RULost. We only want to add links that are useful and work well. Since OIT doesn’t even sanction its use, we decided not to either. OIT is working very diligently to correct this issue along with us. They are in the process of creating a centralized system with all correct information, which we will also interface with. We will be working very hard on getting a great Maps section into RULost. Now, to address the fact that our app is $0.99 and we still have ads. We paid for the $99 developer fee out of pocket and at the time we released the app, its growth was somewhat slow due to our lack of marketing. We were focused on creating the app and not on advertising it. We also have monthly fees for our web server that we have to cover. In order to make back our costs as quickly as possible and break even, we decided the 70% of app sales wouldn’t quite be enough. So, we decided to put a very unobtrusive ad at the bottom of two portions of the app to make a little bit more revenue more quickly. I am also the only member of the team with a Mac, which makes it very difficult to program for the app as a team, since a Mac is required for iOS development. While at Rutgers, the Electrical & Computer Engineering department set up a Mac in the computer lab for us and the Rutgers Alumni Association gave us a Macbook Pro to use. Now, we are left with only me. Therefore, we are also putting money that we make from the app towards getting a development machine for the group. We do plan to get rid of the ads very soon. We are trying to create a platform so that local business can provide special deals and coupons to students through our app. We feel this will be great for the users, because it will give them specials that aren’t available anywhere else and business should also see a rise in customers. I also read your review on the App Store for RULost. You mentioned the following: “App just aggregates information from the Rutgers website.” First of all, you failed to mention anything about NextBus. Secondly, the thing about Rutgers is that it is very decentralized. There is no clear link between different department websites and other types of links at the university. We actually found every single link in the Links section by hand and organized them together for the user. This was no easy task; we actually had to contact departments and let them know that their websites were down. For instance, every time I wanted to see when a break would be coming up, I would have to search on Google for the Rutgers Academic Calendar, because the only way you could find it on the Rutgers site was by searching, and just a little while ago, when you used to search for it on the Rutgers website, the top results were the academic calendars for many years prior. The same applies for the Numbers section of RULost. If you called around and Googled for a while you could find all of that information, but we went and did all of that and organized it for the user in a very simple fashion. In your review you also stated, “Plus, where are the maps for the campus and bus routes?” We actually just got a request from our Comments/Suggestions feature under in the settings menu of RULost asking for a list of stops for the routes. We will try to provide this in the next version as well. If you or anyone else has any feedback or feature requests, we always ask that you submit that through the Comments/Suggestions feature. We are very attentive to our users and many of our features have been a direct result of user feedback. I hope after reading this you will revisit the application with a new outlook. I hope that maybe you can amend your review on the App Store and possible your blog post. We really hate to have negative feedback about our app.